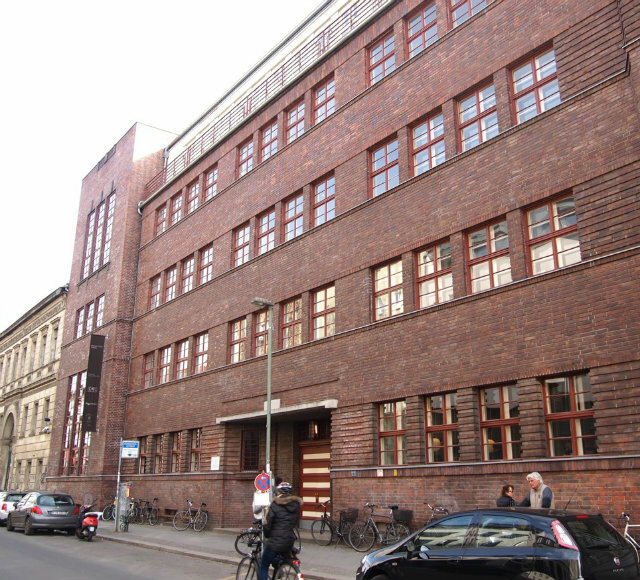 Berlin’s first Jewish girls’ school or Mädchenschule was built in Mitte during 1835. Renovated by prominent Jewish architect Alexander Beer in 1930, the school developed its new home on Auguststraße with a dominant Neue Sachlichkeit – new objectivity – style, with over-aesthetic and art-deco features including a five-story building with a towering red iron clinker façade. The verbose design juxtaposed the practical functionality of the Bauhaus movement that was increasingly popular and controversial at a similar time in the city. Considered a well-off school specialising in the arts and languages, it was an early target in 1933 when the National Socialists came to power, and was finally forced to close in 1942 to become a military hospital until the end of the war. In the post war years, the building sat at the heart of the Soviet sector and eventually became a school again in the 1950s. As the post wall years and reunification developed, the school was left abandoned until the late 90s where it was used as a venue for the Berlin Biennale before being returned to the Jewish community in 2009. Today, the building takes pride of place in one of Berlin’s most well to do areas and is host to a range of popular galleries, restaurants and meeting places for locals and visitors alike. Known as the Haus de Kunst und Esskultur or House of Art and Dining culture, the building attracts both culinary and design enthusiasts from around the world. On the ground floor you’ll find Pauly Saal & Bar. This Michelin star restaurant is the brainchild of Stephan Landwehr and Boris Radczun. Aside from serving some of the best modern Bavarian food in the city, the décor and ambiance simulates a perfect rendition of 1920’s Berlin with velour green chairs, white linen tablecloths wood paneling and a WWI missile mounted under the window. Mouth-watering Pastrami sandwich at Mogg. Mogg is small-seater deli café on the first floor of the Mädchenschule. It is a typical New York Jewish deli with a focus on one key feature: pastrami. 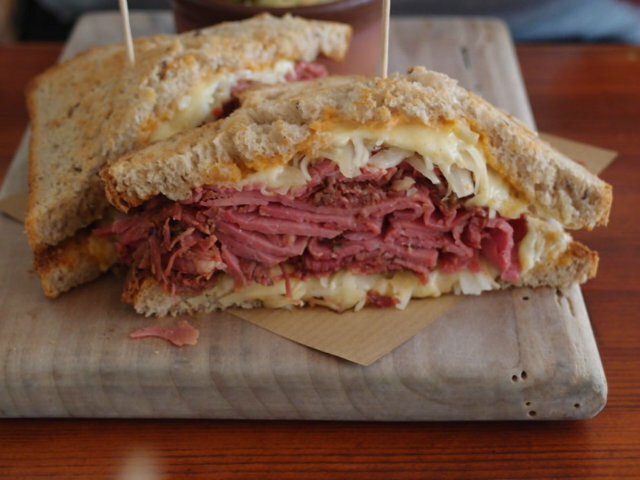 Mogg is home of the Reuben in Berlin, a meat lover’s haven and is available in a small and large size. The pastrami and pulled pork sandwiches are also delicious as is the Matzeknödel soup and one cannot forget about the New York cheesecake. There are also many sides to choose from if you can consider fitting them in after all that pastrami. On the second floor, the Kennedy Museum houses thousands of photos and archives of JFK and Jackie, from their European tours as well as artifacts including briefcases, hats and artistic impressions of the couple and their family in their daily lives. Opening in 2012, The Kennedy’s was a traveling exhibition that has found a permanent home in the Mädchenschule. The third floor of the school is the Michael Fuchs Gallery that exhibits contemporary art. Displaying solo local German artists as well as traveling group shows, the curatorship of Fuchs space is carefully considered and keeps the architecture of the building in mind. From installation pieces, paintings and sculpture the gallery presents around ten shows each year.